If I open a searchbox it opens beneath this empty line. Sometimes this space occurs and sometimes not. I dont know if it is a bug or it has a purpose. I dont have much screen space so i like to remove it if possible. Please try Settings -> Editor -> Appearance -> Show HTML Breadcrumbs. This "empty space without purpose" can display your current position in class (e.g. namespace\class\method) or just ordinary function (e.g. 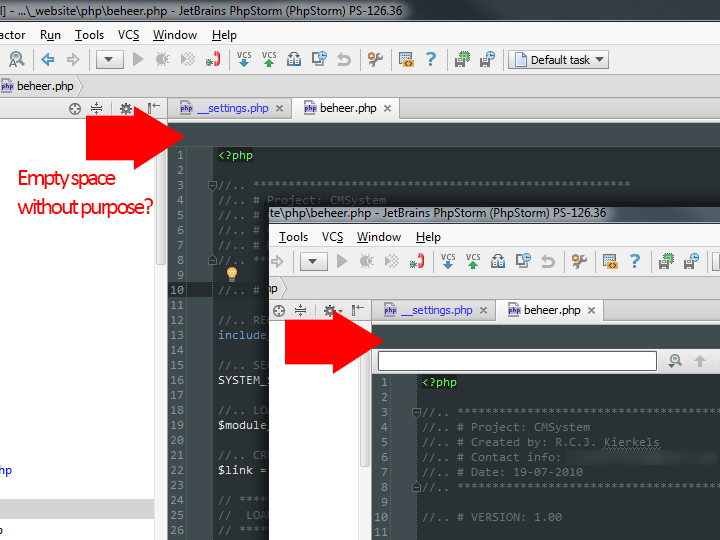 function(params)) for PHP code .. or HTML/XML path in HTML/XML code. If you do not need such info then it is better to disable it. Ok but i thought that the location within a class was always shown as a hover above my code? And is there no option that this line only occurs when needed. I mean now its half the time empty. Btw can i change the background color of this breadcrump space? I cant find it in the settings? Sorry, I'm not sure what you are talking about here. Can you illustrate this with a screenshot please? Bad idea -- I do not want editor (and code) to jump up/down depending on my position in a file (when breadcrumbs line is hidden/visible) -- that's very annoying and was rejected in the past (when discussing this and similar kind of functionality). I'm pretty sure it uses the same color as editor backgroud. You are right about the jumping effect. That is annoying. i could make it look like a extra toolbar and not part of the coding area. But i dont think that is possible right now.